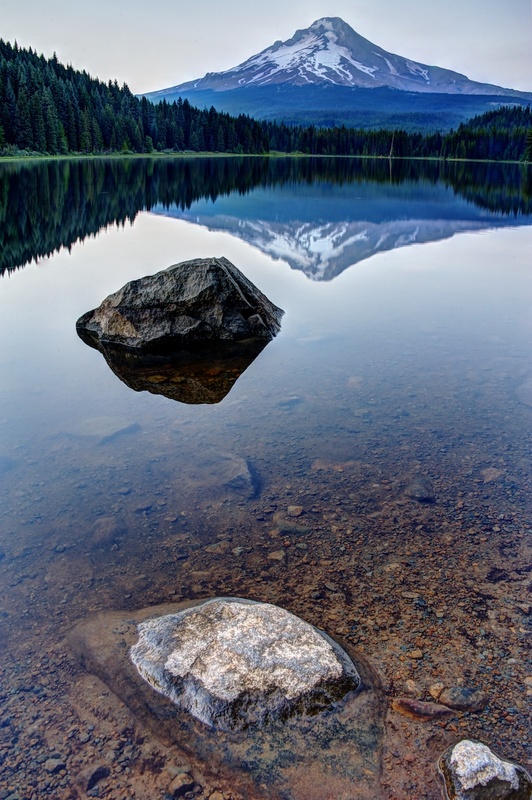 This is Trillium Lake, which is outside of Portland, OR. I was there one evening last August with Dave Wilson and Justin Balog, two great friends and photogs. We made the drive out there so that we could catch a (hopefully) beautiful sunset, but to be honest, the sunset was mostly non-existent. The light was flat and boring. To be clear - the entire scene is incredibly beautiful, from a pure “appreciation of the landscape” point of view - but the sunset lacked any “punch”. It was boring light. It happens, unfortunately. So, I have to admit that I added the orange glow/sunset look to this shot. I don’t normally do this sort of thing, but I do enjoy my time in the digital darkroom, and after playing with this HDR for a while, it just felt like the thing to do. I like it, but I know it’s not “real”. But since this is art, and it’s MY art, I went for it. For comparison purposes, below is the original HDR, before I spiced it up with a little orange glow. I still like the photo, and think it is beautiful in it's own way....just boring. What do you think?